In collaboration with Baithak UK, we were delighted to welcome the legendary Indian actor Shabana Azmi for the UK premiere of the play Broken Images. The play, written by the acclaimed Girish Karnad and directed by the renowned Alyque Padamsee was met with great success to a full house at the Logan Hall, London on 12 March 2017. 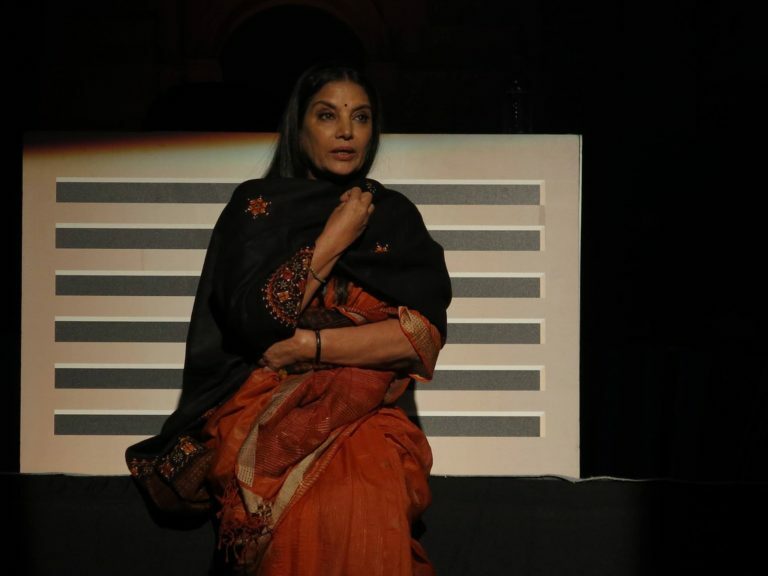 Shabana Azmi, alone on stage, delivered an intense and captivating hour-long performance which explored the intricacies of the human psyche, identity, the complexities of familial relationships, language politics and the challenges of the digital age. This monodrama tells the tale of two sisters, Manjula and Malini. Manjula has risen from being a mediocre writer of Hindi short stories to a successful novelist in English. The drama begins to unfold, as after a TV interview in which Manjula gloats over newly found fame, her doppelgänger appears on a TV screen and torments her. What follows is an enthralling conversation between the digital image of Shabana on screen and Shabana on stage. The audience is left wondering, is this Manjula’s own image acting as her conscience or is it her sister, Malini who died just before the book was published haunting her? The production was followed by an engaging Q&A with the leading actor of international stage and screen as she discussed her methodology, her background and the challenges she met in performing in the play, interacting with a pre-recorded character. Shabana Azmi also discussed her charitable work including how she proudly champions the cause of female empowerment and the role women play in Indian society. Shabana has taken over her father’s NGO, the Mijwan Welfare Society which aims to empower rural India with a focus on girls and women. Just a few days before, Shabana spoke in the House of Lords on the subject of identity and integration, addressing how gender, communities, cultures and nations can be equal, yet separate. Broken Images, a one-woman show proudly marked International Women’s Day. We were thrilled to work in collaboration with Baithak UK, who share our passion for promoting South Asian arts and culture, to bring this innovative play to the UK in this celebratory year of UK-India cultural exchange.